Successful athlete. Model. Sportswear executive. Reilly Peterson has led a charmed life. Until her ex-boyfriend goes psycho and starts stalking her. Now Reilly needs a vacation from her life and a quick course in self-defense. A week at Fantasy Spy Camp's Seattle-based Urban Ops division will teach her how to defend herself using whatever it takes, from her bare hands to an automatic weapon. The last thing she expects to have to protect is her heart. But when she meets hot fellow camper Van Keller survival isn't the only thing on her mind. When a fellow camper disappears, and a cross-dressing goon comes after her, Reilly fears her ex will stop at nothing to make sure she doesn't live long enough to love another day. 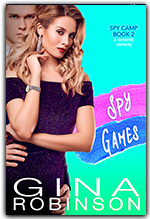 Readers are calling SPY GAMES "Humorous, fast-paced, passionate." "A great read." "Hot action." "A keeper!" "Robinson delivers an entertaining story of stalking, spying, secret identities and hidden agendas." "Spy Games by Gina Robinson will take you off on a journey that will excite you and keep you on the edge of your seat." Gina Robinson was born in Baltimore, Maryland but grew up in the Pacific Northwest and considers herself a native of Washington State. Since 2008, when her debut novel was published, her books have delighted readers and received positive reviews in Publishers Weekly, Booklist, and Romantic Times Book Reviews. 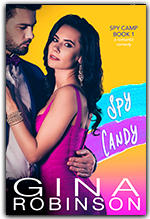 As a voracious reader herself and fan of all types of romantic stories, she writes romance and women's fiction across a wide variety of subgenres—new adult, contemporary, historical, romantic suspense and romantic comedy. Robinson knows how to balance a book with lighthearted romps and serious romance. © 2016-2018 Gina Robinson. All rights reserved. This site uses affiliate codes and is a participant in affiliate advertising programs, including the Amazon Services LLC Associates Program and the iTunes Affiliate Program, designed to provide a means for sites to earn advertising fees by advertising and linking to retailers like amazon.com and iTunes.com.